Famous Celebrities Who Play in the SCA! Can you name this Mystery Peer? Don't copy any of this stuff! 1. Why would you want to? It stinks! 2. Stealing ideas and artwork will give you bad Karma. The information in this publication is from sources believed reliable, but no guaranty or warrant is made as to its accuracy or safety. 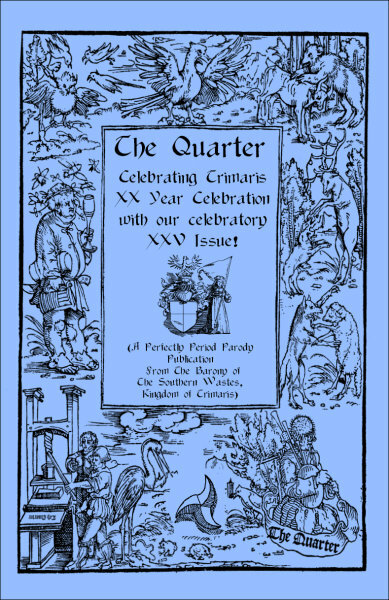 The Editor, The Quarter, and the Society for Creative Anachronism, Inc. assume no liability for the reader's use or misuse of the information contained herein, nor for any resultant property damage, other economic loss or bodily injury arising out of the reader's reliance on any claim, product or procedure contained herein. The information in this issue may prove hazardous, and the reader should take great care when undertaking the activities or handling the products discussed in this publication. The information and procedures discussed in this publication are not intended to be utilized by children. No making up words. This issue may contain satire, humor and possibly even actual legitimate information. Erections lasting longer than four hours require immediate medical attention. Any resemblance to actual persons, places, things or events is either purely coincidental or intended as a parody.